An implant-supported bridge is similar to a regular dental bridge, but it is supported by implants and not by natural teeth. 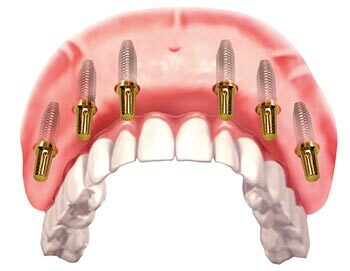 In most cases, when an implant-supported bridge is used, one implant is placed in the jawbone for each missing tooth. In addition, because implant-supported bridges will replace some of your tooth roots, your bone is better preserved. An implant-supported bridge is used when more than one tooth is missing. It also may be used when your dentist is concerned that you might put too much pressure on individual implants that are not connected to each other. This can increase the chances that they will loosen from the bone and fail. An implant-supported bridge reduces the pressure on the individual implants in the bone, and spreads it across the entire bridge.